The Thing About Running | Run Inspired. I’m at a wedding right now and don’t want to miss my daily blog post. 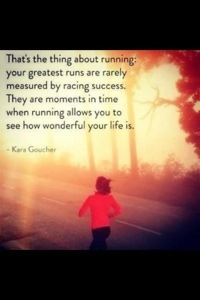 I found this quote from Kara Goucher and it made me smile. Running is life and it always brings me a little perspective. Oh, and I have to give a speech tonight. I’m a little nervous…. Think of all the lovely dressed wedding goers as runners and they will instantly all be your friends.